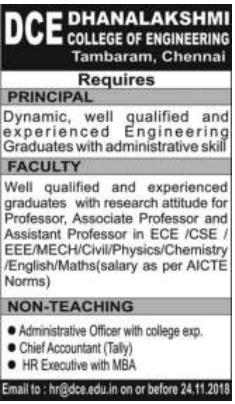 Principal and Faculty Job advertisement by Dhanalakshmi College of Engineering, CHennai, Tamilnadu in The Hindu Epaper Chennai Edition on 18th November 2018. For More details read full post given below. College Profile: Dhanalakshmi College of Engineering, popularly known as DCE is the brain child of the clairvoyant and committed academician Dr. V. P. Ramamurthi, (Dr.V.P.R) a former professor of Anna University. The stint of success accomplished in launching Indian Institute of Professional Education (IIPE) in the year 1993, fuelled the passion of Dr. V.P.R, to establish DCE in the year 2001-02, under the aegis of Dhanalakshmi Educational Trust. The college is approved by the All India Council for Technical Education, New Delhi and is affiliated to Anna University Chennai. The four under graduate courses EEE, ECE, CSE and IT are AICTE – NBA accredited and the institution is ISO 9001:2008 certified. How to Apply: Interested and Eligible candidates may send your application along with recent passport size photograph and necessary documents to the following Postal Address or Email Address with in 24th November 2018.